What is the unique essence of the stage play, 'Moremi', which you're promoting? What informed the whole idea? The story of Moremi signifies great leadership. What makes it more unique is that she was a woman. Great leaders always put the love of their people before themselves and that is what exactly what Moremi did. Moremi was indeed a true feminist who saw the opportunity to save her people not minding the fact that she was a woman. Feminism is not about waiting for something to be handed over to you because you are a woman; it is about getting up and going out to earn it. And this is what Moremi did 1700 years ago, that why she's remembered today. Moremi's story also shows that female leadership did not just start with the influence of western feminism, it started with the sacrifice Moremi made 1,700 years ago. She took that bold step of allowing herself to be captured by invaders of Ife who were taking her people as slaves. Moremi is beyond a stage play. It's deeper. It is a heritage that mustn't be forgotten. It's a stage play about the Yoruba and it stems from our nicknames Aku, Kaaro Oojire or Omoluabi race. We are very concerned, accommodating and passionate about what happens to others. And it's always been like that from time immemorial. So the story of Moremi is very unique and strategic to whom we are. Through the play, we've been able to give honour to women for their leadership and doggedness. The stage play has been able to refresh the minds of the entire populace. We are, however, looking beyond the stage play and going into movie production, international awareness of Moremi as the goddess of liberty. The symbol of the woman holding the torch is the epitome of liberation all over the world. So, for us, its deep and we don't joke with it - and thanks to wonderful people like Princess Aderonke Ademiluyi, Bolanle Austen-Peters and others around me, who are all working on the project together. I give the glory to God, and thanks to the living Moremi of our time, wife of the Governor of Ogun State. She's answered the clarion call as the Moremi from the source in Ogun State. The initiative gives us the opportunity to mentor young women in a way that will enable them to become great leaders of tomorrow. The musical also enables us to tell the story of Moremi in a way that appeals to the new generation of millennials pan-Nigeria and Africa. Moving into the world speaks to the fact that there are only artificial boundaries. Moremi is the goddess of liberty. Moremi is beyond Yoruba land, it's global. We have independence. The day we are at liberty is the day we can liberate the youths from poverty. That's why our leaders should never rest. I tell them all the time; we are seated on the keg of gunpowder. We need to liberate our youths so they can be effective in adding value to the growth of this nation. They are so stressed right now and unhappy. Leaders of this country should continue to invest in youths of Nigeria. The future of the country is in their hands. They own it and someday they'll call for it. It's for our leaders to build a legacy for themselves. One would expect that your choice of the 'living Moremi' would come from Osun State. Why Ogun State? The Yoruba are close to 500 million all over the world. All that you see are artificial boundaries. We are one big happy family. 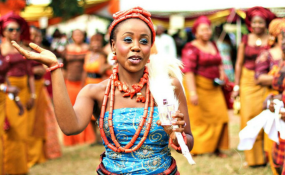 She is a Yoruba woman deeply rooted in her heritage. She's in Ogun State as the first lady. At some point, there was nothing as Ogun, Osun, or Oyo states. Some people created that. There was nothing like Nigeria at some point. We all belong to one happy family called the black race. We are all descendants of Oduduwa. We've gone far and it's a big achievement for us a race. Now it's been established scientifically in Harvard Medical School that the oldest race in the world is Yoruba. The Yoruba, the Igbo, and the Igala are pretty much the oldest races in the world; and the largest ethnic races in Nigeria not directly mixed are the Yoruba and the Igbo. The Afro-Asians are the Fulani and the Hausa. We've done so much, although we haven't given out the official statement. What we'll be doing next is the mobile museum. It would house the largest artefacts collection which would depict and tell our story as Yoruba. It's the first in the world done by the black race. It is noteworthy that they took our artefacts out of Africa; they know the potency of just a few of the many that were taken away. Our story is hinged on divinity and humanity. We've had three dynasties of a cycle spanning several hundreds of thousands of years, and I am the 53rd king of the third dynasty, although people don't like to talk about the first two dynasties. It is because the first has to do with spirituality and divinity. They were humans in spirit form. The second dynasty witnessed super-humans until the transition to humans. But the spirit of our ancestors from the first dynasty still lives in us. Once we finished the programme, we'll let the world know that the existence of the Yoruba race predates any other race. What we've achieved is the research about telling every race has emerged across the entire black race. Every soul left out of Africa. You've been at the fore of the Yoruba narrative across the globe. As the custodian of the Yoruba culture and heritage, how do feel when you see the Whites practise Ifa divination in their countries? All those divinities are real and potent, they don't die. So for different races to be practising these things, it shows what is called the life of perpetuity of the divinity world. Spirits don't die. Abrahamic religion - basically Islam and Christianity, all came from the lineage of Abraham. We believe in the spirit of our ancestors, as a result, Yoruba has the potency of the divinities, as for that, it's survived over 400 years of slave trade and it's still alive. They've tried to destroy it, no way. The world couldn't and it's because spirits don't die, and that's why it's practised all over the world. It would continue to grow and I'm positive about it because it's the oldest in terms of serving God. For us, God created all the divinities for Yoruba people. It's alive and can never die. You have to move with time. Today, anyone who wants information goes to Google. The engine room and software backing Google are based on algorithms. Without it, you can never write software. If you write the software, you need hardware to drive it. Algorithms are based on the computations of Ifa, 16 by 16 totalling 256. But it's been changed from the old ways of casting 16 by 16, equalling 256, to zeros and ones. The binary codes of the ancient days of counting one to make two is still the same binary codes of zeros and ones, but in a more refined way. We believe strongly and it's been proven by the western world that everything is still based on Ifa divination. We Google every day, and it's based on the 256 algorithms. It came in a new form and you still get the same result. Time changes things and situations. Right now, everyone still consults Ifa. You these Journalists! You like to cause controversies. I'll tell you the honest truth, it is a lie. The Akiolu that I know believes in our heritage and tradition and he's a no-nonsense king. It's good to give honour to whom honour is due and that is the president of the country. He didn't do it but the media played it up. If you look at the chair Mr. President sat on, it was one of the chairs for VIPs in his palace, though it carried the inscription, 'Oba of Lagos'. His throne is intact. People did Photoshop and cut a portion. They didn't look at the wider background of the picture of the president viz-a-viz the throne of the Oba of Lagos. People now assumed that the president sat on the throne, it's not true. It's completely false and mischievous. The Yoruba will say, as you carry your calabash, others would carry for you. As Yoruba, we're lucky our foundation is deeply rooted in the Almighty God. It's celestial and that's why it'll be difficult for the race to go into extinction. The divinities started and emerged from us. That we're lucky doesn't mean we shouldn't propagate and nurture our heritage. And that's what we are doing. We want to keep it intact and that's what I'm championing. Some school of thoughts may want to prove me wrong. But I mean it when I say Google is Ifa. Ask all the best brains in Google if they can do Google with 16 by 16 binary codes. If they can, are able to tell me we cannot do it? They've won but if not, it's case closed. The foundation is critical and our foundation is the divinities. We will continue to push the originality of the Yoruba people. It's very deep, and that's what the Ife of old is known for. Ife is known for white and purity. We invented clothes and it started from the throne of Oduduwa. We were the first to wear clothes. The first set (of clothes) we made turned out to be white. That's what excites me about Ife; it's the white apparel. In those days, everyone wore white. So, I'm trying to return us to the age-old tradition and fashion of wearing white attire. For me, it goes with my spirit. My spirit-head cannot wear any other colour besides white. We are in a period of trials. It's harsh but let's keep our body and unity together. At some point, we'll come out of it. For anyone who hasn't seen you beyond the confines of official mood, they wouldn't know how convivial and funny you are. Are you always friendly? I joke a lot because it makes me feel relaxed. I can be very playful but that doesn't mean I'll lose the essence of my office. I joke a lot and that's how to take life easy and simple. Simplicity is my watchword. I don't think I'll change because that's who I am. I am human but to a large extent, I do more of spiritual things. I have a very deep sense of it. So every day I pray to God to suppress my anger. I don't want to get angry about anything. It kills a lot of things. It burns and dissipates energy and brings in negativity. I can' stand negative energy. It doesn't work for the kind of my calling. I pray for God to continually suppress anger. It's just the grace of God because there are too many rules surrounding spirituality. As a spiritual head of a race with a calling, I have things I must do. It's how I met it, and I must uphold it. It's very difficult because there are too many rules surrounding spirituality. As a spiritual head of a race with a calling, I have things I must do. It's how I met it, and I must uphold it. It's very difficult because there are too many rules. I can't so too many things, but God has been helping me. I'm very happy and passionate about what I do. I chair and it's relative. To me, it's about service and I have to give respect to some very prominent kings in Yoruba land. More so, I met them there. I can't do things alone. I pay respect to the Alaafin of Oyo, the Awujale of Ijebu who's been there for 56 years, Oba of Lagos, Oba of Idanre and several of them have been on the throne for years. We have to carry one another along. It's about a common front. I am young and want to use the same advantage. I can run around on their behalf. I'll rather be a servant to a united race than a divided race. I'm a young servant King for a race I want united.